Far too many companies fixate on short-term payoffs. They cling to the idea that numbers are king, and everything else is useless. These kinds of companies often enjoy short-term rewards. They reap growth and profits for months, even years. But in the end, they fail. But where do these companies go wrong? And how can you keep yourself from falling in the same trap? Culture is what sets these companies apart from those that enjoy long-term success. If you’re looking to build a company that survives you, you need to establish a culture of trust in your business. There’s a big difference between a leader and someone with a megaphone shouting out orders. Unfortunately, the megaphone personality leads many businesses and organizations. They give orders, watch numbers, and keep things running and growing on their own. These kinds of leaders can make some impressive headway with their work. But what happens when they’re gone? They leave behind a company that is so dependent on their leader that they’re left hoping the new one is as good. And if they’re not, the company sinks. This can happen because of a leader’s own fear of letting go of tasks. Take a look at our post, 3 Tips for Systemizing Your Business, where we offer advice on letting go of smaller tasks to focus on the bigger picture. Another fallout that comes from short-sighted businesses is layoffs. Layoffs can be reasonable last resorts for struggling businesses. Yet too many use them as an annual tool to pad numbers. This conditions employees to fixate on short-term performance themselves. Even worse, they begin to view their coworkers as enemies. It’s a dog eat dog world mentality takes over. There is no business that benefits from its employees fighting each other. A true leader doesn’t focus on short-term payoffs and numbers; they focus on people. A culture of compassion and teamwork will carry a business long after its founder is gone. Take the time to train, support, and protect your team. A well-trained team will handle situations on their own and with confidence. You’ll save time and money by investing in their training. Any investment in your team is a worthy one. Supporting your team with good benefits and fair pay will keep them loyal and motivated. When word gets around that you’re good to your employees, you’ll find amazing people vying to work with you. Your customers will grow to love not only your product or service, but your business as well. Finally, protecting your team means that they will feel safe. They’ll provide stellar service to your customers without fear of reprimand. They’ll be comfortable enough to form relationships with coworkers and clients. These kinds of bonds will further your business’s growth, brand, and success. These actions build a culture that will survive long after you. Your business will become not only your accomplishment, but your legacy. Take a look at some of these team building exercises for ideas on how to help your team become stronger. A culture of fear can yield excellent short-term results. But what kind of entrepreneur only plans on being around a few years? 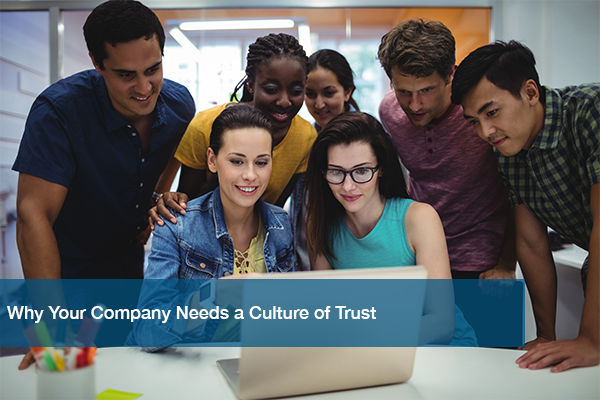 Companies that create a culture of trust outperform their counterparts over time. They also support more stable growth and profits. Be good to your team, and give your company the culture it needs to stick around long after you retire. ITC can help manage your tech so you can focus on your business – including your people. We help small businesses every day with their IT needs, and we’d love to help you, too. Schedule a free IT analysis today!